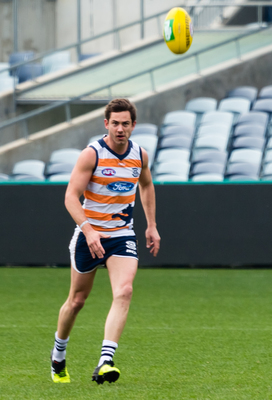 GONE: Daniel Menzel training in his days with the Cats. Delisted Cats forward Daniel Menzel has secured a place on Sydney’s list after medical checks cleared him to play on despite four knee reconstructions. Geelong dumped Menzel at the end of the season after he kicked 100 goals in his last 50 games for the Cats while coming under fire for a perceived lack of defensive pressure. Geelong picked him at number 17 in the 2009 AFL draft but he managed only 73 games after his series of knee injuries and a setback related to treatment for a groin injury last year. Menzel returned from holidays in the United States to undergo medical testing for the Swans but had gone back to the US before Sydney announced the signing this week. “I’m really thankful and excited at the opportunity the Swans have given me and I’m looking forward to getting into the club and training with my new teammates,” he said. The Swans described Menzel, who they signed to a one-year deal, as an “exciting forward”. New Swans Head of Football Charlie Gardiner says the Club is looking forward to welcoming Menzel to Sydney.